Is there a relationship between gender and injury? I first wrote about gender and injury in yoga in this article from December 2013: Women’s Flexibility a Liability (In Yoga)? I was responding to an article by William J. Broad. While the article makes assertions about gender and yoga practice or yoga asana experience, most of the reports are anecdotal. It’s possible that anecdotal reports are indicative of a real trend that would be uncovered upon further investigation and it’s also possible that they describe the experience of only a few individuals. As there is currently very little research compiling data on the relationship of gender and yoga experience, including injuries, it’s certainly worth asking questions about gender and yoga experience to see what is there. Often in discussions in the media, women are discussed as inherently “more flexible”. This claim is usually not specific (more flexible in what ways exactly?). It also doesn’t take into consideration the wide spectrum of bodies that occur regardless of gender or the multitude of other activities that people engage in that impact aspects of flexibility and/or strength. 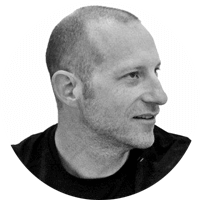 These general assertions about gender and yoga practice are therefore not especially helpful if our intent is to support practice for each individual student. Our interest in the survey project was to identify any specific trends or lack thereof that relate yoga experience and gender. This would give us information as practitioners and teachers about specific situations for additional caution and communication as we practice. Remember that statistical analysis, in the most general sense, is a method of calculating the likelihood of one particular outcome in a situation given a specific set of circumstances. We include the information: n=some number, to tell you how many people answered the question we’re reporting on. Survey participants were not required to answer every question, so the sample size for each question varies. Remember also that you’ll see within the text, this symbol: p=some number. This value, referred to as the “p-value” is the probability that variables in the survey are unrelated. If the p-value is less than 0.05, then there is a less than 5% probability that the variables are unrelated or you could say there is a more than 95% probability that the variables are related. We would then say there is a statistically significant relationship between the two variables. We also report the “effect size” of the relationship between the two variables. Effect size describes the strength of the association between the two related variables. For example, we might say that two related variables have a weak, moderate, or strong relationship to one another. This is noted as Cramer’s V=some number. We say there is a small association when Cramer’s V is between 0.1 and 0.2, a moderate association when Cramer’s V is between 0.3 and 0.4, and a strong association when Cramer’s V is equal to 0.5 or greater. ***Where we report significance in relationship between gender and another variable in the rest of this post, statistics were run without the data for “prefer not to say” and “other” because sample sizes in those two categories were too small for an accurate analysis. Generally, we found few differences between the genders in the reported aspects of yoga experience. We found a small association between gender and reason for beginning a yoga practice (p<.0001; Cramer’s V=0.12) The same most common primary reason for beginning a yoga practice, physical aspects, was reported by women and men. 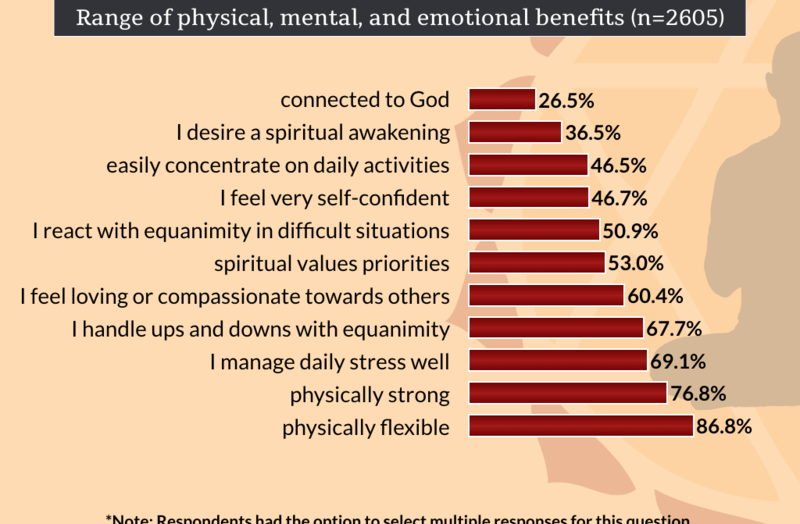 However, the percent of respondents who chose mental/emotional, spiritual pursuit, or other reasons for starting a yoga practice differed between women and men. 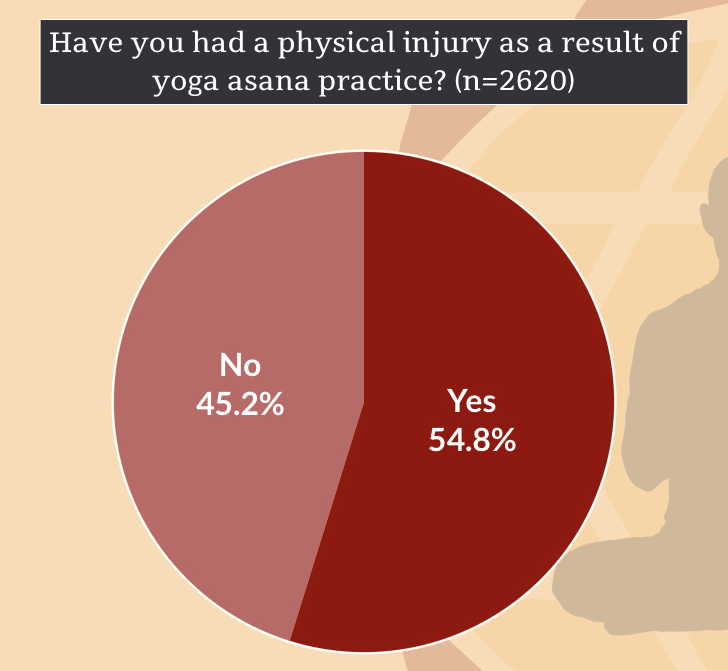 We found no relationship between gender and whether or not respondents reported ever having had an injury in yoga. We did find a small relationship between gender and reporting a knee injury (p<.0001; Cramer’s V=0.15). Men were more likely than women to have reported a knee injury from yoga. Of total practitioners who had experienced an injury, 37% of men and 20% of women reported a knee injury. 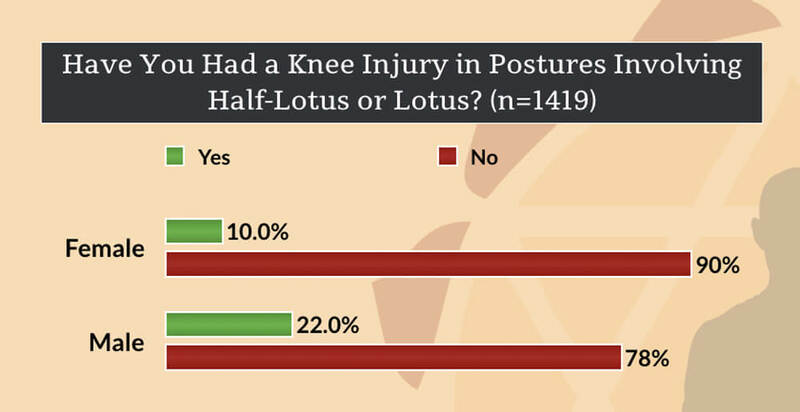 Specifically, knee injuries were likely to have occurred in a posture that included half-lotus or lotus. Again there was a small difference in experience by gender (p<.0001; Cramer’s V=0.15). 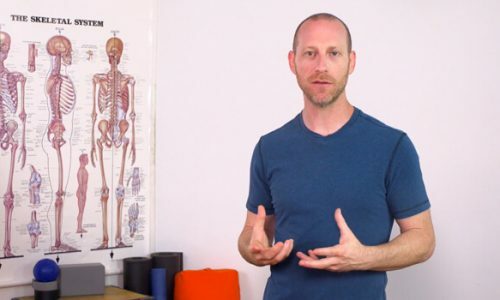 Of total practitioners who had experienced an injury, 22% of men and 10% of women reported an injury in a posture including a half-lotus or lotus. Slightly less than half (49.5%) of women in our survey reported having given birth (n=2261). 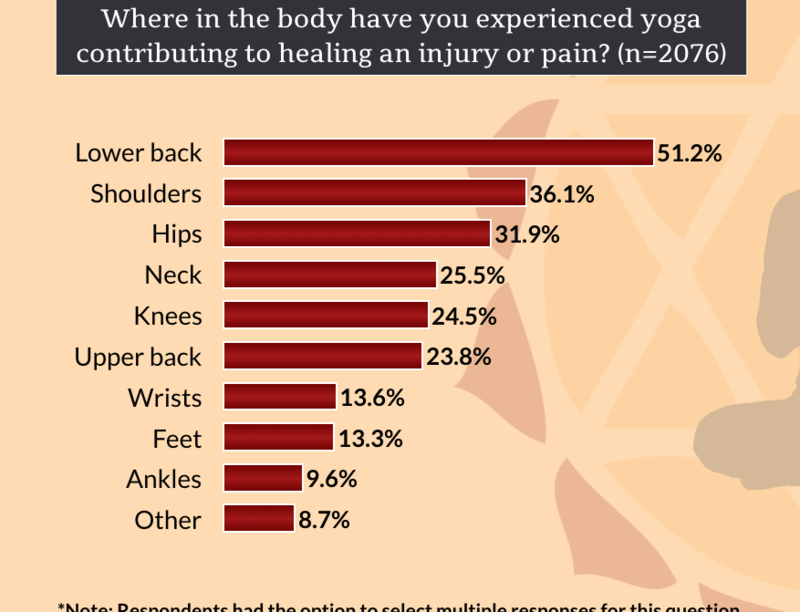 We found no associations between having given birth and experiencing yoga contributing to healing from a pain or injury or having a negative experience in yoga. Similarly, having experienced childbirth had no association with increased likelihood of reporting specific types of injuries in yoga. More than half (60.1%) of our survey respondents reported that they were teaching yoga. With regard to gender, we found a negligible association between gender and likelihood of teaching yoga asana (n=2612). This is interesting as it suggests that even though men made up only 15.3% of yoga participants, more than half of those were teachers. As women made up the well more than the majority of participants (84.5%), you might expect there to be a greater number of female teachers, but that’s not what we saw. What seems clear from our survey is that there is more about the experience of yoga that is similar between genders than there is a difference. It reminds us that, paradoxically, the experience of yoga and the context in which practice happens can be viewed both as universal and as unique to each individual. Interesting article for sure. I must admit I have never even considered if there were a difference in injury rates. However the data collected is food for thought.